They say 2000 feet above Hyderabad is a sky paved with gold. Taj Falaknuma Palace, the very essence of its name has a meaning that says Mirror in the sky, and true to its name it stands in grandeur, 500 feet above the city itself. The palace was designed in 1894 by a British architect Willam Ward Marret, and is set on a 32-acre estate. He employed an idiosyncratic combination of Renaissance and baroque styles to create an immense structure that was clearly intended to rival the palaces of European royalty. For this week I chose this palace as the perfect getaway. It is not just a mere resort but a palace, wherein the guests receive the highest standards of royalty treatment amidst beautiful Mughal, Japanese ,and Rajasthani gardens. Those who have revelled in its opulence have revelled in its large Venetian chandeliers, rare furniture, grand marble staircases and gurgling fountains, priceless statues, and objects d'art, stained-glass windows, unique sketches and murals encased in ornate frames, a world-class collection of crystal as well as the elaborate gardens said to be personally conceived by the Nizam. Upon reaching the hotel entrance, drinks and cold towels welcome you before you are escorted up the grand staircase where rose petals are showered on you! The welcome in itself is so memorable that it leaves you feeling incredible and an unforgettable start before you get to see how else the place is going to surprise you! Palace interior highlights include 18 types of marble, 16 types of wood and 10 types of chandeliers. Among other noticeable higlight is the Gol Bungalow modeled after the White House on one side and Buckingham Palace on the other. 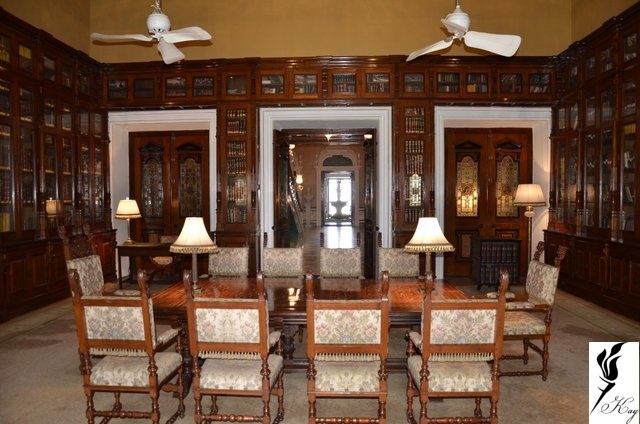 The Palace Library is a must visit is a sight to behold, a replica of the one at Windsor Castle, is a collector's envy as it is home to the rarest of manuscripts, books and one of the most acclaimed collections of the Holy Quran in the country, all of which were selected and brought back by the Nizam himself. The palace library is home to 5,970 books and guests can actually read 150 of them. The hotel offers a choice of 60 uniquely distinct rooms and suites with comprehensive business facilities, 2 specialty restaurants, an outdoor pool and the exclusive Jiva Spa which makes it an ideal choice for the luxury traveller. With the most perfect location in terms of view and practicality, It is about 22 km from the swank shopping district of Banjara Hills and 28km from the Hitech city, and is an absolute haven of living like a royalty for real and one that will always be a part of your memory- the royal feelings! With Falaknuma you don't stay in a hotel, you reside in History! The exterior was painted more than 100 times so it would match the color of the sky at dusk. The 8th Nizam is still alive and lives in Turkey. His daughter Princess Ezra lives in Santa Barbara, CA and helped with the restorations. 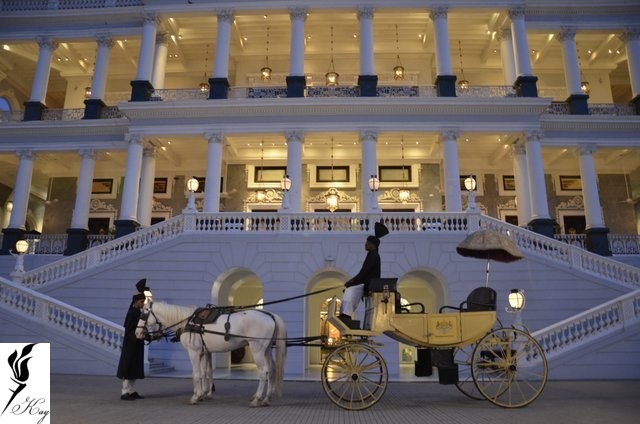 ‘Falaknuma’ means ‘mirror of the sky’ which is why the princess insisted the exterior color be painted more than 100 times until it perfectly matched the color of the sky at dusk. -Osman Ali Khan, Asaf Jah VII (the seventh Nizam) was the richest man in the world in 1940 and was on the cover of Time Magazine.